President Paul Hennigan led the signing of the final beam for Point Park University's new Pittsburgh Playhouse, set to open in 2018 on Forbes Avenue in Downtown Pittsburgh. "This is an important day in the life of the new Pittsburgh Playhouse and Point Park University," Hennigan said at the topping-off ceremony Nov. 30. 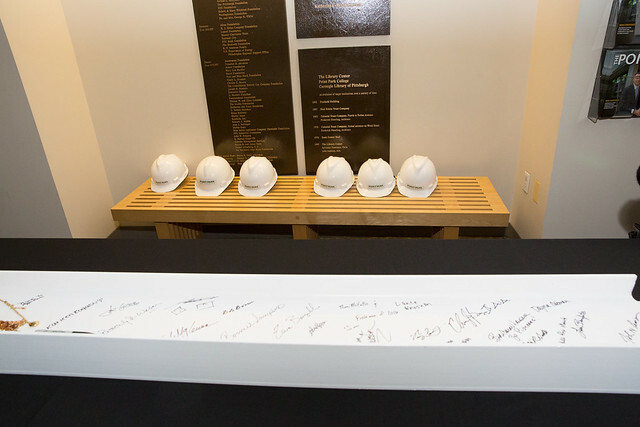 "As you sign the beam, I would like you to think about what it represents for you. For me, it represents the crown jewel of the Academic Village Initiative." Performance students will use studios and stages. Tech students will design and build masterful sets. Cinema students will use the sound stage. Business students will run every aspect of the new Pittsburgh Playhouse. Communication students will do all of the marketing, advertising, promotions and social media. Arts and Sciences students will host a wide variety of speakers and topics on every topic imaginable. Artists from around the country will flock to the new Playhouse to try out their new works. Hennigan added, "For the first time in 50 years, Point Park University will have it's entire physical campus right in the heart of Downtown Pittsburgh. I believe it will become the heartbeat of Downtown Pittsburgh." Community members can watch the development of the new Pittsburgh Playhouse with our construction cam, which allows viewers to watch the construction process unfold in real time 24/7. Interested in helping us complete this historic project? Want to tour the site? Contact us for more information.